In second place was WSFM, with 10% audience share, although its positioned was weakened by a 1.3 percentage point loss. Nova Entertainment's Smooth FM also remained in third position with an audience share of 9.3%. It also suffered a dip in listeners, but at a small rate at 0.3 percentage points. Nova 96.9 followed with a 7.5% audience share, down from the last survey by 0.4 points. Macquarie Media's 2GB also keeps top spot in the breakfast slot with 19% audience share, up 2.1 percentage points since the previous survey. After being dethroned in August, Kyle and Jackie O are back in the top spot for commercial radio breakfast with an audience of 10.2%. The duo increased their audience by 0.9 percentage points to take the second spot for breakfast. Australian Radio Network's WSFM followed with a 9.3% audience share, down one percentage point. In fourth was ABC Sydney with 8.9% audience share, down 0.2 percentage points from the last survey. The struggling 104.1 2 Day FM took a 3.6% audience share. Despite Em Rusciano leaving in September the show managed to increase its listeners by 0.3 percentage points. The morning show is currently hosted by Grant Denyer and Ed Kavalee. Nova 96.9 won in the drive slot with 12.8% audience share, up 0.6%. In second was 2GB with presenter Ben Fordham which again boosted its audience share by 1.2 percentage points. It took 10.3% audience share. WSFM remained static with 9.9% in third spot. Smooth FM took the fourth spot with 9.4% audience share after a 0.1 percentage point loss. ARN's Edge Digital increased its listeners by 8,000 to take the top spot away from ABC Jazz with 102,000 listeners. In second place, ABC Jazz took 96,000 listeners after losing 12,000 listeners. Coles Radio remains in third place with 81,000 listeners, down by 2,000 from the last survey. In the sixth radio ratings of the year total listeners in the Melbourne market, 3AW remained number one with a 13.5% audience share, growing by 0.3 percentage points since survey five. In the FM battle, Nova's Smooth FM 91.5 took out the second spot for total audience share, reaching 9.9%, despite a decline of 0.5 percentage points. SCA's 101.9 Fox FM came in a close third with an audience share of 9.4%, falling by 0.6 percentage points. Next up was ARN's Gold 104.3, which fell out of the top commercial spot, dipping by 0.6 percentage points, reaching an audience share of 9.3%. Macquarie Media's 3AW won the radio breakfast slot battle, despite a small drop off from the previous survey, losing another 0.2 percentage points, with an audience share of 18.4%. SCA's Fox FM breakfast show trio of Fifi, Fev and Bryon held firm in second position, despite its audience share declining by 0.7 percentage points, taking its audience share to 9.6%. Mike Perso and Jennifer Hansen on Smooth FM's More Music Breakfast Show came in third with 8.2%, increasing by 0.5 percentage points. They were followed by Nova 100's Chrissie, Sam & Browny show, who increased by 0.1 percentage point, taking a 7.8% audience share. Triple M's Hot Breakfast Show with Eddie McGuire held in fifth position, up 0.7 percentage points, garnering an audience share of 7.7%. ARN's Gold 104.3 breakfast show, featuring new host, UK radio personality Chris O'Connell, slipped to sixth place dropping off by 0.7 percentage points and falling to a 6.7% audience share. Kiis came in behind Gold, remaining unchanged with a 5.9% share. In the drive slot, Fox FM's drive show duos, Carrie & Tommy followed by Hughesy and Kate, held strong in the top spot once again with a 10.5% audience share, despite dropping off once again in audience share, this time by 1.5 percentage points. The show continues to decline, despite holding the top spot, with the drive program losing 1.2 percentage points in the fifth survey. 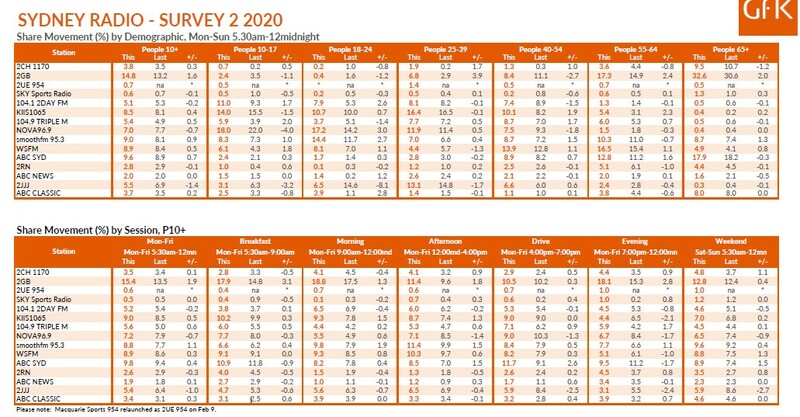 3AW came in second behind Fox, taking an audience share of 9.9%, growing by 0.1 percentage points from last survey. In third place was Smooth FM, with drive host Byron Webb earning a 0.4 percentage point boost in popularity, taking a 9.8% audience share. Gold 104.3's Gavin Miller came in fourth, suffering a 0.5 percentage point decline from the last survey, now with a 9.7% share. Nova 100's Kate, Tim & Marty remained in fifth place, growing its audience by 0.2 percentage points, with a share of 8.1% of Melbournes drive time audience. 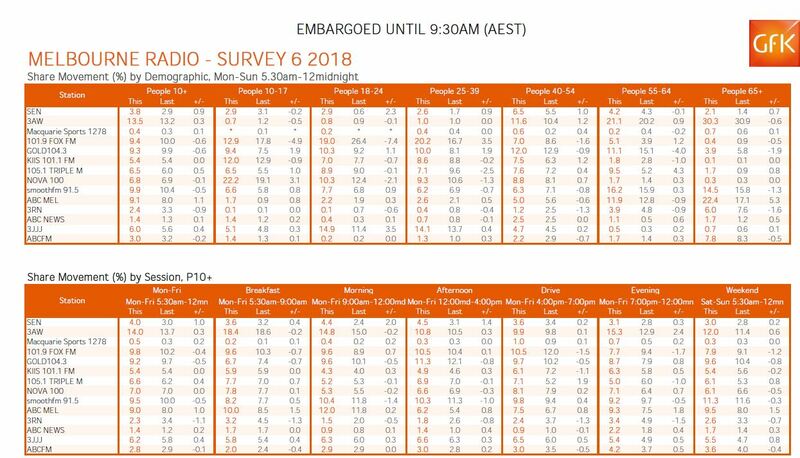 Triple M came in seventh place behind the ABC, with a 7.1% share, jumping by 1.9 percentage points since the last survey, while Kiis trailed in seventh place, with a 6.1% share, dropping off by 1.1 points. The latest round of ratings was also the sixth inclusion of digital radio ratings for Melbourne. In total people, SCA's OldSkool Hits had the highest audience, reaching a total audience of 83,000, growing its listeners by 21,000. Double J was knocked by to second place, with 77,000, down 3000 listeners since last ratings. In third place was Coles Radio with 64,000 listeners, dropping off by 1000. The next radio ratings are due out on 13 November. Today marks the sixth radio ratings of 2018, including digital radio ratings, with results representing 15 July to 22 September. The charts below (click to expand) show ratings across Sydney, Melbourne, Brisbane, Adelaide and Perth. Check out the last survey results here.